For an undergraduate student, Adedotun Adejare, W’19, has accumulated an impressive range of experiences on his resume. Now in his senior year, Adedotun has already spent three summers in investment banking and consulting and is now setting his sights on China, where he will be spending a year learning with the best students from across the world in the Schwarzman Program. The Schwarzman Program is an all-in-one competitive scholarship and Masters program that awards Masters of Global Affairs degrees after a year of study at the Schwarzman College at Tsinghua University in Beijing. This year, Adedotun, along with Johnathan Chen, W19, E’19, and Zhongyuan Zeng, MCP’19, was one of 142 scholars selected from over 4000 applicants. Adedotun chose the program because of its combination of world-class academics and a strong focus on individual interests. “What differentiated this scholarship from others is that you learn at one of the best schools in the world in an international atmosphere but you also travel to gain a primary source perspective,” he said. Adedotun, who is envisioning a career in the tech industry, sees China as the perfect launchpad for learning more about technology applications in manufacturing. Adedotun has taken advantage of multiple global learning opportunities while at Wharton. These courses cemented his interest in technology and applications and encouraged him to apply for a Masters program halfway across the world. The Schwarzman Program’s competitive application process encourages students to not just think about their ambitions but also consider the potential negative impact their future career might have and come up with ways to solve these issues. In his application essays, Adedotun reflected on how his interest in manufacturing technology will contribute to the eventual replacement of human labor. “I want to be in this industry, but it can also create disruption. Manufacturing technology can cut into a lot of jobs, for instance in traditional automotive due to autonomous vehicles and electric vehicles, or other kinds of technologies. So I wrote about how industrialized countries need to do more to reduce the friction in reemployment and to create more robust cities that are accessible to new people, revamping education such that a lot more students can benefit from having an impact on the workforce as opposed to having a hard time graduating without a job,” he said. In addition to having a social impact component, the application process gave students an opportunity to network with leaders from different areas of life. 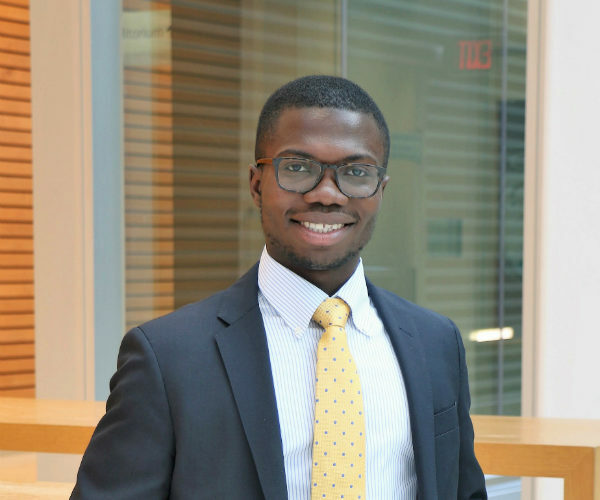 Adedotun credits Black Wharton Undergraduate Association for helping him adjust to the demands of the corporate internship application process during his transition from high school to Wharton. How Do Wharton’s East and West Coast EMBA Classes Mix?